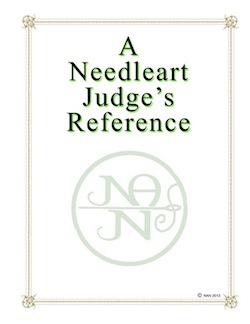 This unique publication is a concise reference for judges as well as a guide for needle artists at all skill levels seeking to improve their work. More than 15 NAN-certified judges collaborated to make the book possible. For each of the techniques discussed, a brief background is provided, including history, distinguishing features, materials employed, and a list of qualities for which judges look. Also included are sections on non-technique considerations and logistical issues for judges. Published in 2013, A Needleart Judge’s Reference is 62 double-sided pages with a comb binding, and includes a Bibliography. To purchase the book, download the order form here.